The Rocket Launcher T34 Calliope is a premium Rank III American medium tank with a battle rating of 4.3 (AB/RB/SB). It was introduced with Update 1.49 "Weapons of Victory". 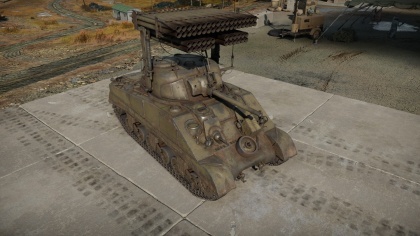 Though using the base model of a M4 Sherman, it has a 60 round rocket rack sitting above the turret that fires 114 mm rockets at a general location. While giving the team a good edge in firepower, the rocket rack also presents a large weak point that can be targeted with a high-explosive round for an ammo-rack detonation. This vehicle has guide rails for 114 mm M8 rockets mounted on a M4 tank turret. However, the additional rocket payload makes fire from the main cannon impossible. All rockets have to be used before the 75mm can be fired. The coaxial LMG is not affected by this. The rocket armaments greatest disadvantage is the innaccuracy, despite its finstabilized tail. There is no guidance system, thus every barrage needs to be fired in an arc, greatly increasing the warhead dispersion. Furthermore the stabilizing fins showed little impact in lateral guidance when fired from the ground, in comparison with their aerial version. Another drawback is the small warhead with only a 1.9 kg of high explosive filler. Adequate against barricades and entrenchments, but lacking in stopping power against heavy armoured vehicles such as tanks and pillboxes. Additionally, as with any other ground vehicle firing unguided rockets, the weapon will present a very loud but distinct firing signature, allowing enemies to identify the type of vehicle as well as its location on the map. The distinct smoke trail from fired rockets can also reveal the position of the vehicle. However, the higher fire rate of the M8 rockets allows for multiple volleys of rockets to be fired quickly at a target. The ensueing flash, fire and smoke effects from constant barrage against a target can temporarily blind targets and in some cases can cause sudden software performance dips such as drops in frame rate due to the smoke effects, hindering enemy targeting. This rocket launcher system allowed fire not only from a defilade position but also from point-blank range. So, once all the rockets have been fired, the Calliope may continue to fight as a standard tank. Drawbacks are the inaccuracy of the volleys due arc fire and the lack of anti-tank damage. The warheads are pure HE, thus they need to hit thinly armoured areas, like rooftops and armour hulls above the tracks to be able to deal any sort of damage. by high-explosives when there are rockets. The T34 Calliope is effective as a close quarters brawler. It should aim to start engagements suddenly and spam rockets primarily at an enemy's main cannon and roof armour. It is a small chance that this will immediately disable or knock out an enemy vehicle. This is usually enough to either finish off the target with rockets or by using the 75mm cannon. 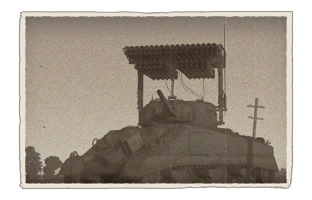 The Sherman is already a pretty large vehicle, the addition of the rockets makes the Calliope stick out like a sore thumb. Midway into World War II in 1943, the Western Allies realized that unlike the Soviet Union, they did not have any form of a "multiple rocket launcher system" that the Soviets had with their Katyusha Launchers trucks. The idea of rocket launchers isn't new at this period, they present some advantage over the standard mortar or howitzer. The rocket launcher can launch massive amounts of high-explosive ammunition at a longer distance at a shorter time with a greater psychological impact than normal artillery, at the price of a longer reload time and less accuracy. The Soviets showed the best utilization of this weapon with their Katyushas, having a whole bunch of them fire at a designated target, minimizing accuracy loss with a full area saturation of fire. The effectiveness of this system prompted the Allies to start producing some form of multiple rocket launcher system as well. In 1943, the project began in United States and the design was to use the current M4 Sherman tanks in service to mount the rocket launchers to bring into combat. The design, developed by Victor Hawkins, had a rocket mount on the Sherman turret with sixty launch tubes, all made to fire the 4.5 in. M8 rockets. The project gave the experimental tank design the designation T34, and the troops adopted the name "Calliope", which was the name of a steam organ and has a similar look. These rocket launcher tanks were sent to France in 1944, although many never saw combat for various reasons. During its development, three different variants were made. The original T34 had 60 tubes for the 4.5 in. rockets with 36 fixed tubes on top and 24 on the bottom able to be jettisoned (except on the M4A1 Sherman variant). The second, T34E1, has the 24 jettisonable tubes replaced by 28 tubes, though the total tubes was still 60. The T34E2 had the rocket caliber increased from 4.5 in. to 7.2 in. with the same 60 tubes. This saw combat during the 1944-1945 time span. However, the modifications of the Shermans seem unnecessary as the war progressed, new development had the rocket launcher system mated to trucks, armoured chassis, and jeeps so the tanks could be left alone to do its purpose. But when the Calliope saw service in the Pacific and Europe, its performance was moderately successful. The T34 was replaced by the T40 "Whiz Bang" Sherman, which was a Sherman with a tank-mounted multiple rocket launcher system like the T34, but only saw combat in the last few months of the war and had the 7.2 in. rockets. 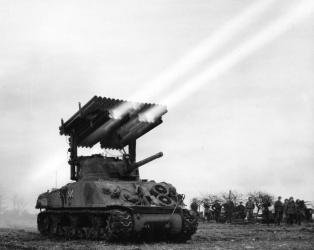 The T34 "Calliope" firing a salvo of 4.5 inch rockets. This page was last edited on 20 March 2019, at 02:48.